M S Sheela is a leading Carnatic classical vocalist who has made her mark in classical, light as well as devotional genres of music. She has the rare distinction of being a top rank artist of AIR and Doordarshan in both classical and light music. Hailing from a from a musically endowed family, Sheela sang her first notes under the guidance of her mother late Smt M N Rathna, a popular musician of yesteryears. 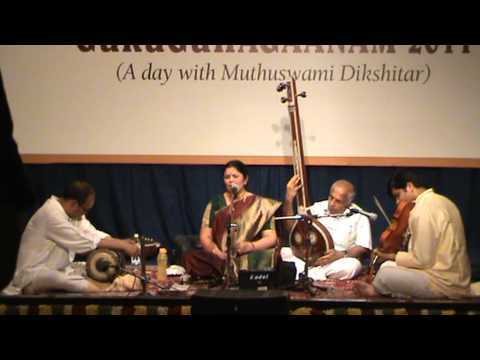 Strict and rigorous training under Sangeetha Kalanidhi Dr R K Srikantan added luster to her musical prowess. She has a postgraduate degree in Music from Bangalore University, and is a Gold medallist. Having taken to the stage at an early age, M S Sheela has performed widely across the nation and abroad. She has been performing regularly on All India Radio and Doordarshan, and has featured on the Radio Sangeeth Sammelan, Trinity Festival, National Programmes and numerous special features. She has performed in USA, Canada and Australia. Sheela was sponsored by the State Government of Karnataka for her US concert tour. CMNA, New Jersey, Bhairavi Fine Arts, Cleveland, USA, Nadatarangini Fine Arts, Washington, Carnatic Music Circle of Australia are few among the organizations abroad that have hosted her performances. M S Sheela has also performed in Middle East and London. M S Sheela has a large number of audio releases to her credit. Sheela, along with her husband Prof B K Ramaswamy, has founded Hamsadhwani Creations, to promote classical music through innovative programmes and thematic audio albums. 'Haridasa Namana', 'Palinchu Kamakshi', 'Guru Raghavendra' are some of her audio releases through Hamsadhwani Creations. She roped in all the leading carnatic vocalists of the state for Hamsadhwani's thematic series such as 'Haridasa Namana' and 'Vaggeya Vaibhava'. M S Sheela is the first woman artist from Karnataka who has a top rank in Carnatic music. She is also the first top rank artist from the state in Sugama Sangeetha (light music). Also a trained Bharatanatyam Dancer, Sheela used to give dance performances till the early 90's. The senior musician from Bangalore who has been popular in both classical and light music.